A Little bit of Lorene: A Finish!!! Hi everyone! I have a new grandson that should arrive towards the end of the month. A new baby! oh, that just thrills my heart. I am so excited for Ashton and Elena. this will give them two girls and two boys. even Stephen! But I do have a problem with that. Up until this new little one arrives, we are even with our grands. 10 boys and ten girls! So someone needs to step up to the plate and have this little red haired girl I have dreamt about for several years! Melissa and Glen are the ones that have the red headed babies, so it must mean them, right? But Ashton and Elena could have a red head. hmmmmm, I wonder what they think? 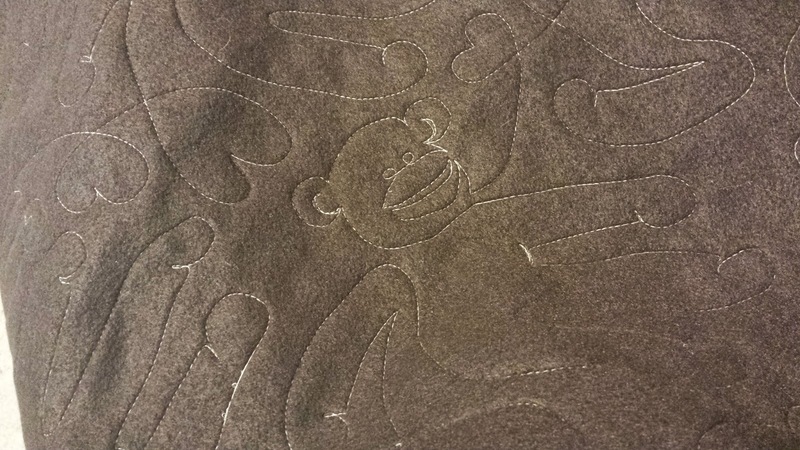 Anyway, a while back I had the opportunity to test a pattern for Quilt doodle doodles and I LOVED the pattern. perfect for this new little guy! I just pulled it off my HQ16. and it's squared up. I just need to cut the binding and bind it, and it will be ready for the little guy. 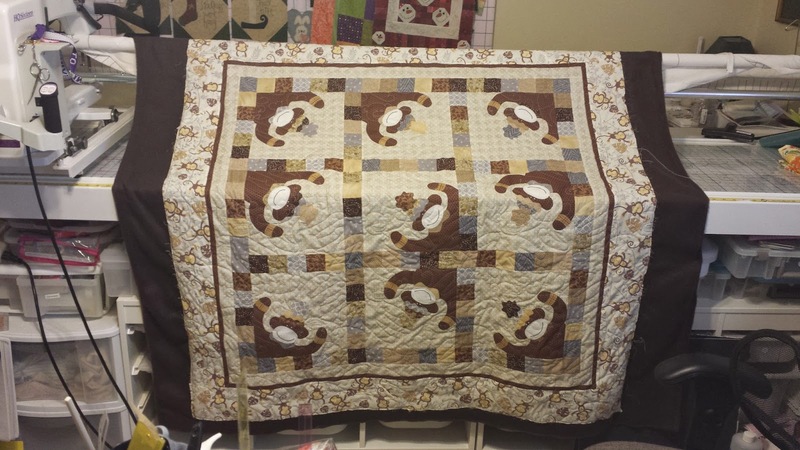 isn't that the perfect quilt for a new little holbrook boy? I backed it with brown fleece, no batting. they live up in ID where it SNOWS! and gets cold. Remember I am a AZ girl and don't understand these things...... I found the cutest panto at Urban Elementz . it's sock monkey! I used so fine thread from Superior threads. it was a very soft yellow. I think it turned out well. I love quilt doodles patterns, they are easy, quick, and fun to make. I have several of her patterns. AND I get to test another pattern for her. this time Sunflowers. I have everything cut, and hopefully this weekend I will get the top together. I am really looking forward to it. The quilt finished at 51" square. I used a total of 5 yards. it is not a UFO. but it is finished! and that is still a very good thing.